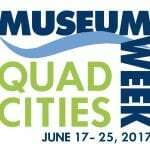 On June 17 through 25, over 20 museums from across the Quad Cities region will come together for the third annual Quad Cities Museum Week. Enjoy this celebration of our region’s museums and participate in special activities, exhibits and promotions during this fun-filled week. This year’s theme will be “QC Spotlight”. Each museum will feature people, items, inventions, products, and historical events that spotlight and tell a story about the Quad Cities. Get out and learn about the people who made a difference in the Quad Cities, significant historical events, amazing inventions and products made in the Quad Cities. Museum Week is the perfect opportunity for families and friends to get out and explore. Each museum features its own, theme, history, galleries, and exhibits. Come and discover these wonderful historical and cultural treasures that add to the quality of life in our region. We encourage you to tweet and post on your Facebook page about your Museum Week experiences using #QCMUSEUMS.